Done with all Cross Image puzzles ? Great ! Looking for more experience ?... You are at the right place ! 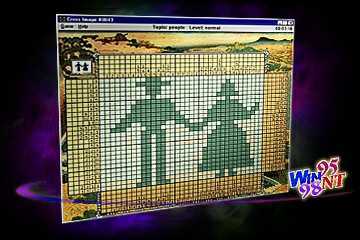 Add 100 new images to your current collection of Cross Image puzzles ! We've included various stuff into this add-on library. All images are divided into 17 categories from animals to utensil and sidearms, and 3 complexity levels. Run Cross Image and open "Select Game" dialog box. You can select new image either by its number (it is in the range #0101 - #0200) or by its version (we've assigned version #2 to all images within this library). We hope you'll enjoy this collection. Have fun, ... and don't forget to come back to us again ! More exciting add-ons are coming up.